The South Carolina State Library’s Talking Book Services will host an author talk by Michael Hingson for Blindness Awareness Month on October 18, 2018. Hingson, a blind survivor of the 9/11 attack on the World Trade Center, will tell his life story and detail how he and his guide dog made it out of the Twin Towers alive. His talk begins at 6:00 p.m., with a reception opening at 5:00 p.m. and a book signing afterward. Registration is required. Please visit our event calendar to reserve your seat today. 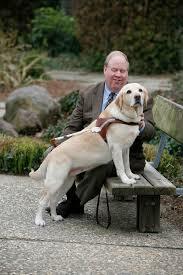 On September 11, 2001, a blind man escaped the World Trade Center by walking down 78 flights of stairs with his guide dog. Days later, America fell in love with Mike and Roselle and the special bond that helped them both survive one of the country’s darkest days. Following the 9/11 tragedy, Michael was featured on the Larry King show five times. According to King, “Michael Hingson is an international hero honored and awarded by top organizations worldwide.” He now travels the world as a keynote and inspirational speaker who can motivate audiences to action. He has also put his experience in a book called Thunder Dog (DB 73300) which is available from us and downloadable from BARD. What does Michael Hingson Do? After 9/11, Hingson began speaking to audiences about his experience on that day as well as discussing his thoughts on life and dealing with change. He has become a recognized internationally acclaimed public speaker who captivates audiences with his personal and compelling story. He also teaches his listeners new ways of looking at life and their worlds by helping them to visualize from his viewpoint how to live, function, and thrive. He demonstrates through stories and personal examples of how anyone can be a leader and become more successful in whatever they attempt to do. First and foremost, Mike personally connects with every audience member by drawing them into his world and showing them how to use their own inner tools more effectively than they ever thought possible. Mike speaks to and has expertise on topics including leadership, teamwork, trust, inclusion, public speaking, disabilities, survival, change and much more. This program is free and open to the public. Register today!